The Castle Bros. were contractors that specialized in laying cement sidewalks, using a variant of cement they called Cementine. The brothers were Thomas W. A. Castle (1863-1902) and Walter L. Castle (1867-1952). They were born in England and immigrated to the U. S. in the 1880s. Their business was first listed in Brooklyn city directories in 1895. On Thomas Castle's death in 1902 the following appeared in the Brooklyn Daily Standard, Friday, 30 May 1902, "Thomas W. A. Castle, a well known resident of Flatbush, died yesterday at his home, 2627 Bedford avenue, after an illness of two weeks with typhoid fever. Mr. Castle was born in England thirty-nine years ago. He came to America twenty years ago and took up his residence in Brooklyn, and shortly afterward moved to Flatbush. He was past commander of Palestine Encampment, No. 62, Knights of St. John and Malta, and was a member of Midwood Council, 1618, Royal Arcanum; the Mechanics' and Traders' Exchange, and the Cortelyou Club of Flatbush. He was also a member of St. Paul's P. E. Church, Flatbush. Mr. Castle was the senior partner of the firm of Castle Bros., cementine sidewalk manufacturers, and was well known in Brooklyn and Manhattan, and had a large circle of friends. He leaves a widow and seven small children. The Knights of St. John and Malta will hold funeral services at the late residence of the deceased to-morrow evening, and on Sunday afternoon at 2 o'clock the funeral services will be conducted by the Rev. T. G. Jackson, rector of St. Paul's Church. The interment will be in Greenwood Cemetery." On his death in 1952 Walter L. Castle had the following notice in the New York Times "Walter L. Castle, Brooklyn cement contractor whose firm built the grandstands at Ebbets Field, died yesterday in Methodist Hospital, Brooklyn, after an illness of six weeks. His age was 85. Mr. Castle, who resided at 15 Martense Court, in the Flatbush section, was born in Canterbury, England, and came to the United States in 1888 and set up a contracting business. He was a founder of Castle Brothers, a firm dealing in cement and doing cement and concrete contracting. At his death, Mr. Castle was a senior warden of St. Paul's Protestant Episcopal Church, Flatbush. He was also a vice president and trustee of the Flatbush Savings Bank and the oldest living Past Master of the Kings County Masonic Council No. 1. Surviving are a daughter, Mrs. Vivian Castle Eshelman of Lancaster, Pa.; a son, Jack L. Castle; a brother, Albert; ten grandchildren, and twelve great-grandchildren." "
Quoting Flatbush of Today, 1908, "Walter L. Castle, of the firm of Castle Brothers, has perhaps through his business done as much as any one man toward beautifying Flatbush. His concern has curbed and guttered and laid miles upon miles of cementine sidewalks throughout Flatbush. His firm has also done all the cement work in every school building in Flatbush, except one, laying all the cement floors from cellar to roof, as well as walks, curbing and gutters. They have laid over ten million feet of cementine in Brooklyn. Mr. Walter L. Castle was born in Canterbury, Kent, England. He is the secretary, treasurer and manager of Castle Bros. Cementine Co. They came to Flatbush fifteen years ago from Brooklyn to lay walks for the Germania Real Estate Company in their opening venture in Vanderveer Park. Since that time the company has undertaken and completed many large contracts for the city and real estate developers of Flatbush and vicinity, notably South Midwood, Rugby, Ditmas Park, Kings Oak, and Borough Park. One of Mr. Castle's largest single contracts was the opening, grading and paving of Bedford Avenue from Eastern Parkway to Flatbush Avenue, amounting to $51,000, said to be the largest cement paving contract ever let by the Highway Department, and took over a year to complete. He has at present nearly $100,000 worth of contracts in cementine work on eight new school buildings. Mr. Castle is a member and vestryman of St. Paul's P. E. Church, the Midwood and Cortelyou Clubs, and the Eighteenth Assembly District Republican Club; also a member of Kings County Lodge, F. and A. M.; Orient Chapter, R. A. M.; Clinton Commandery, Knight Templars; Kismet Temple, A. A. O. N. M. I.; Past Commander, Palestine Encampment, K. of St. J. V. M.; Past Commander, Prospect Tent, K. O. T. M.; Past Regent, Midwood Council, R. A.; Past President, Cortelyou Club." This ad for the Castle Brothers appeared in the Brooklyn Engineers' Club Proceedings for 1911. A similar ad from 1907 shows that they had a dock on the Gowanus Canal at Douglass St. A study entitled Gowanus Canal Corridor Rezoning Project, prepared for the New York City Department of City Planning in May 2009 mentions Castle Bros. several places. Maps on pages 71 (dated 1904) and 72 (dated 1915) in this study show the location of Castle Bros. on Douglass St. near the Gowanus Canal. The Castle Bros. offices and yard on Snyder Ave. were two or three miles away in Flatbush. Castle Bros. were in business approximately 1895 to 1945. A very similar business was that of Albert E. Castle, contractors, who were in business in Brooklyn approximately 1916 to 1959. The proprietor here was Albert Edmund Castle (1882-?). Albert E. Castle was born in Canterbury, England, 6 June 1882, and immigrated to the U. S. around 1890. His relationship to the brothers, Thomas W. A. Castle and Walter L. Castle, is not clear. He was possibly a nephew. A considerable number of Cementine plaques are still to be found in Brooklyn sidewalks. One that has a different form is located at 226 Cumberland St., reading T. W. A. Castle and Flatbush L. I. This plaque found in the Fort Green area may represent a time when Thomas W. A. Castle was in business by himself before taking Walter L. Castle as his partner. 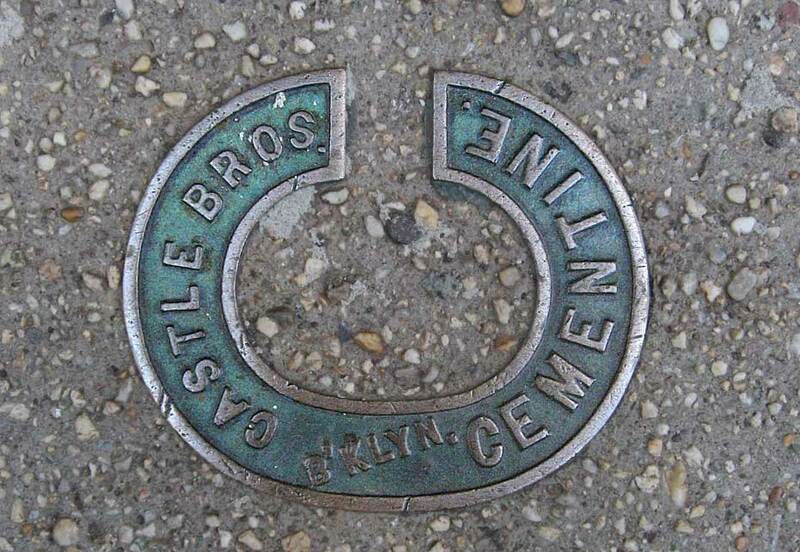 There are also Castle Bros. Cementine coal chute covers located at 142 Willow St. in Brooklyn Heights, and on Herkimer St. in Crown Heights, Brooklyn.